Since the end of the 1970s Christina Kubisch works with the system of electromagnetic induction, which she developed from the basic technique to an individual artistic tool. 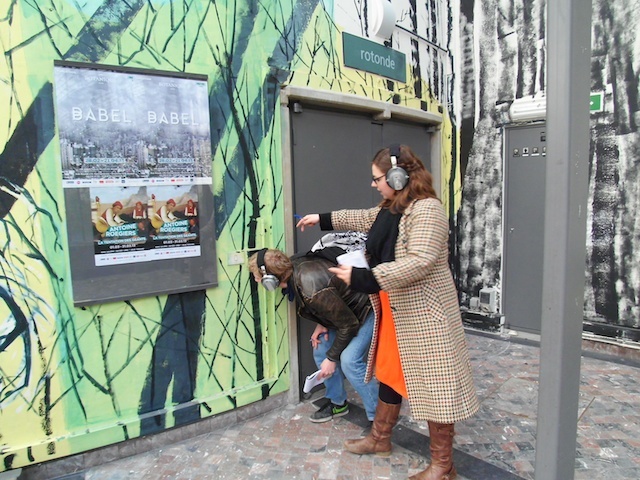 In 2003 she started her research on a new series of works in public space, which trace the electro-magnetic fields of urban environments in the form of city walks.The first Electrical Walk took place in Cologne in 2004. Electrical Walks is a work in progress. It is a public walk with special, sensitive wireless headphones by which the acoustic qualities of aboveground and underground electromagnetic fields become amplified and audible. . The transmission of sound is made by built-in coils which respond to the electromagnetic waves in our environment. The palette of these noises, their timbre and volume vary from site to site and from country to country. They have one thing in common: they are ubiquitous, even where one would not expect them. Light systems, wireless comunication systems, radar systems, anti-theft security devices, surveillance cameras, cell phones, computers, streetcar cables, antennae, navigation systemes, automated teller machines, wireless internet, neon advertising, public transportation networks, etc. create electrical fields that are as if hidden under cloaks of invisibility, but of incredible presence. The sounds are much more musical than one could expect. There are complex layers of high and low frequencies, loops of rhythmic sequences, groups of tiny signals, long drones and many things which change constantly and are hard to describe. Some sounds are sound much alike all over the world. Others are specific for a city or country and cannot be found anywhere else. Electrical walks is an an invitation to a special kind of investigation of city centres (or elsewhere). With the magnetic headphone and a map of the environs, upon which the possible routes and especially interesting electrical fields are marked, the visitor can set off on his own or in a group. The perception of everyday reality changes when one listens to the electromagnetic fields; what is accustomed appears in a different context. Nothing looks the way it sounds. And nothing sounds the way it looks. In March 2013 Christina Kubisch, together with students Pierre Lizin, Lucas Derycke, Annelies Moons, Maarten Coosemans, Misha Koole, Bert Beauprez, Sander Gillis and Joren Carels, explored the Botanical Gardens’ electromagnetic field. In the course of the workshop they drew up a map indicating electromagnetic hot spots that would allow visitors to hear the normally hidden fields of current by means of special wireless headphones. The way we perceive the Botanical Gardens is fundamentally altered by listening to its electrical currents. The known appears in a different context and nothing looks like it sounds. Is it a Jardin botanique or a Jardin électrique?